A study published in the July 2014 issue of the Journal of Studies on Alcohol and Drugs revealed that the brands of alcohol popular among underage drinkers are the same ones most heavily advertised in magazines read by youth. The findings provide further evidence that alcohol ads can encourage young people to drink. The researchers looked at alcohol ads that ran in U.S. magazines in 2011, with a focus on ads for the top 25 alcohol brands consumed by underage drinkers. Those brands were advertised more heavily in magazines read by young people than 308 other alcohol brands that are less popular with underage drinkers, the investigators found. Compared to the other brands, the most popular brands were five to nine times more likely to heavily expose 18- to 20-year-olds to their magazine ads, the findings showed. Because of the dangers associated with underage drinking, MADD is concerned about the effects that alcohol advertisements have on our youth. All of the ads in the study were in complete compliance with the industry’s self-regulatory guidelines, which suggest that alcohol ads should be restricted to magazines with less than 30 percent of readers who are younger than 21. However, MADD believes in stricter standards, including prohibiting advertising to audiences with less than 90 percent adults aged 21 and older viewership. Since parents cannot always control the type of advertisements their teens are exposed to, it is important to talk with your teens early and often about the dangers of underage drinking. 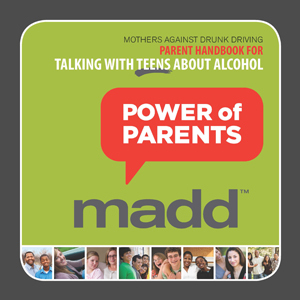 MADD’s Power of Parents® program can provide the tools you need to start this potentially lifesaving conversation with your teen. Click here to download the free Parent Handbook.